I was up in Antrim for Paddy's weekend with Pauline. We weren't there to visit any breweries or even drink beer for that matter. We were there to enjoy the wonderful Bushmills Inn and do the distillery tour. I was also armed with my DSL to take pictures but the weather was rubbish. I took 200 photos and only a handful (like the one above) are in any way good. Dull grey skies make for boring photos but the one above was taken during a momentary lull in the weather. We had missed out on the distillery tour the last time we where there but got free whiskey at their bar before spending a fortune in the gift shop. Of course, a trip away with me wouldn't be complete without beer and this was no exception. At the end of the distillery tour when we headed to the bar for our free whiskey, there in the corner I noticed a stand with Lacada serving samples of their beer so I went to say hello. I had already been talking to my friend Simon who's on the Lacada board about a visit. Laurie the brewer was there and had been told to expect me the net day. 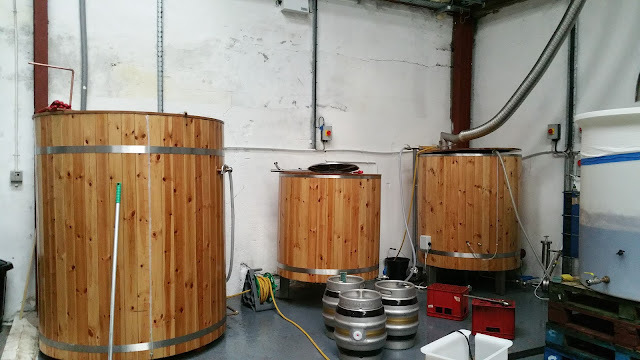 I talked to Laurie the next day and he was gong to be in Bushmills so said he would pick me up a few hours later and bring me to Portrush to see the brewery. We had lunch first, had a few Glens of Antrim beers and then Laurie picked us up after 4pm. Lacada is a co-op brewery, just like Boundary brewing in Belfast. It's a very interesting name. 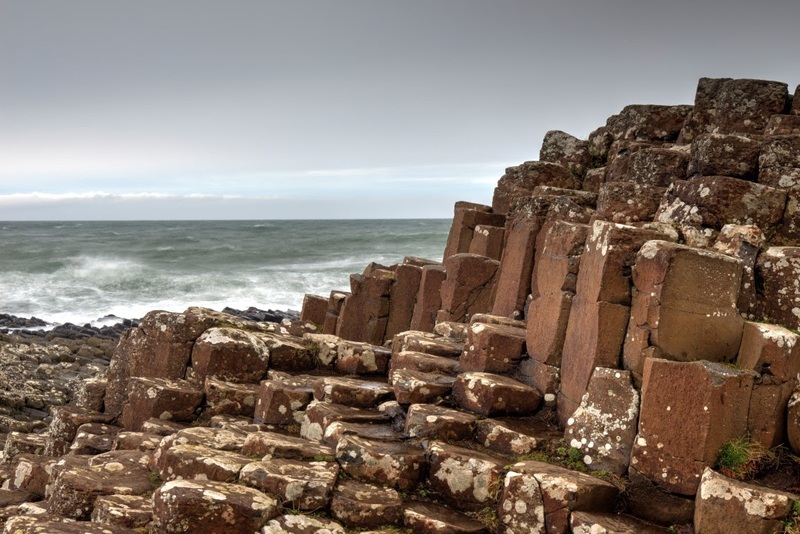 It comes from the nearby Lacada point by the Giant's Causeway. In 1588, a ship called Girona from the Spanish Armada was shipwrecked on this point. Later in late 1960s, a dive team located some of the lost treasures. One of the items discovered was a golden salamander with wings. It also contained rubies. This salamander is now in the Ulster museum and became the logo of the Lacada brewery. They use a standard David Porter brewkit and have plenty of space to expand. 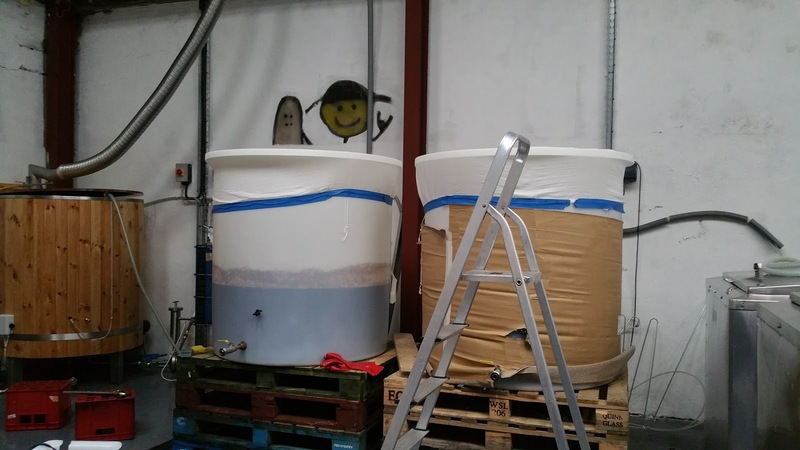 They are currently only brewing twice a month on the main kit but they have a smaller 70 litre pilot system they can play with. 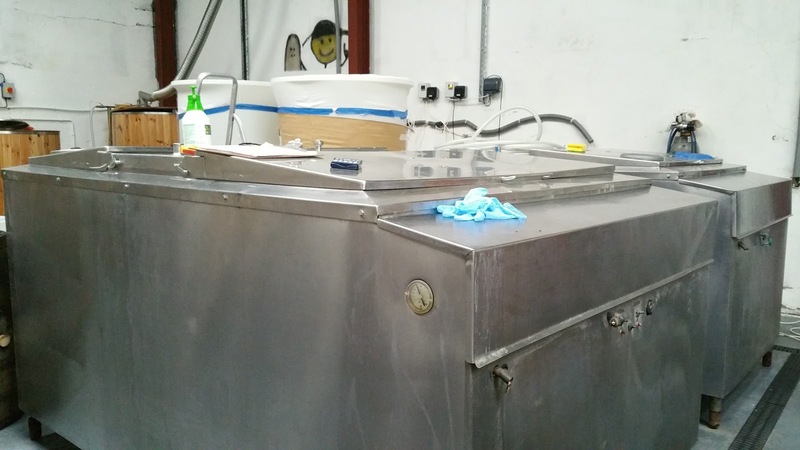 Surprisingly, these plastic containers are fermenters which they use alongside the stainless steel dairy containers. They actually look like a giant beginner homebrew boil kettle. I took a picture of some of the old labels which feature some very cool artwork. I love the one for Stranded Bunny, though I feel bad for the poor bunny. 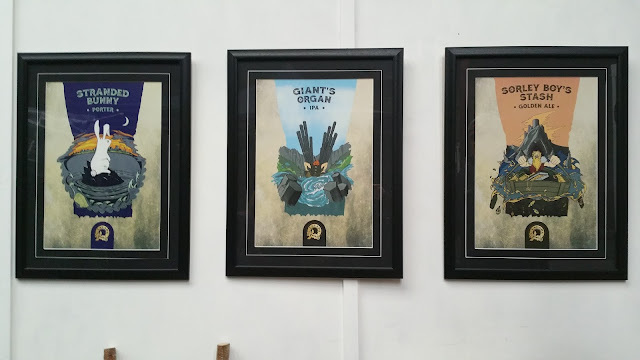 Giant's Organ on the other hand is very suggestive and has actually been returned by certain outlets for being too offensive. North Antrim is pretty conservative so some people don't like anything that has the suggestion of any part of the human anatomy. 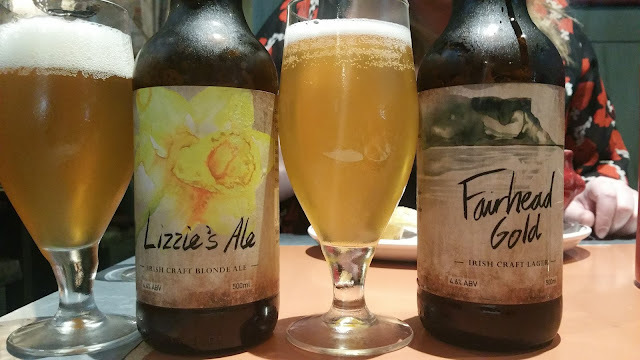 Here are some of the bottles we tried. The older labelled Stranded Bunny on the left and the newer branding is on the right. This one is for their Salamander series which is for the limited edition specials. The one on the right wasn't labelled bit it was called Sauer Beans, a tart/sour made with local coffee from Babushka. The base beer was their Eldersauer, a slightly sour beer with elderflower. They are more tart than sour which mean Pauline, who hates sour beer, actually enjoyed them. 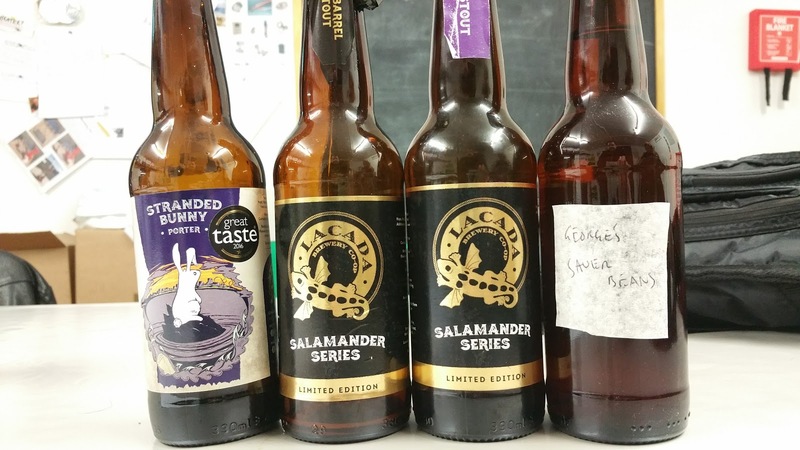 I think the highlights of the Lacada beers for both of us were the Salamander Series: Utopian Stout which is deliciously creamy and flavoursome and then Devil's Washtub which is a respectable black IPA. Actually, Cascadian Dark Ale works better as a description in this case. Afterwards, we headed to Kiwi's which has a great range of Irish and international craft beer in bottles and cans. They only had one craft beer on tap which was Beavertown Gamma Ray and Simon had the last of that one. There was time to catch the second half of the Ireland/England rugby match. The place was absolutely packed, far more than they had expected. They ran out of food but thankfully allowed people to bring back takeaways. That's a very reasonable attitude to have and it makes perfect sense. Bring in food (as long as they are no longer serving) so you can sit down and enjoy the beer you purchased there. So many pubs will outright refuse, even if they don't serve food in the first place. Well done to Kiwi's but feck them too because their mega meat burger looked amazing and I really wanted one. We had copious amounts of Devil's Washtub that evening as well as a few other UK beers. Thanks to Laurie, Jack, Simon, and the team at Lacada for their hospitality.